You can view your Mac folders as icons, columns, or even as album covers. You can change the view of your Mac folders by simply clicking the appropriate View button in the toolbar at the top of the Finder window. The View Options window changes depending on which view you have chosen. The figure shows the home folder window through what’s known as the icon view because the windows are populated by pretty little pictures. You know the Music subfolder by its icon of a musical note. And you know the Movies subfolder by the small picture of a strip of film or (in pre-Leopard versions of OS X) a movie clapper. If you’re having trouble viewing the View buttons, click the oval button to the upper-right corner of the window to zoom in. You can change the size of the icons by choosing View→Show View Icons and moving the Icon size slider from left to right. Drag the Grid spacing slider to change the distance between icons. By choosing View→View Options, you can alter the position of an icon label by clicking the Bottom or Right radio button. You can change the color of the window background or use one of your own images as the background. You can also arrange the order of icons by the date they were modified, the date they were created, size, kind, or label. Or choose Snap to Grid to make icons obediently align themselves in rows and columns. 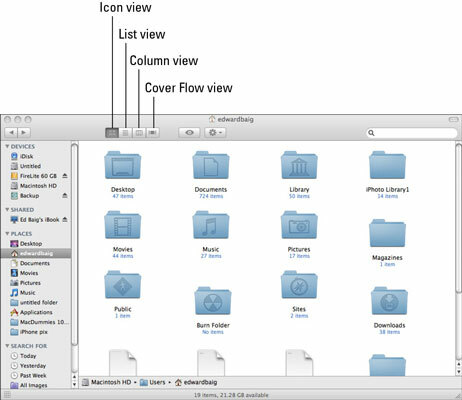 To see your Mac folders by column, choose View→As Columns. The check mark moves, altering your perspective. Several vertical panes appear inside one large window. These smaller windows within windows show a progression. At the far left is a pane called the sidebar, a regular hangout for your network, hard disk, home folder, applications, documents, movies and more. The sidebar appears in the same place in every Finder window. If you have a folder highlighted in the sidebar, the pane to its immediate right displays its contents. Highlight an item in that pane, and the folder to its immediate right reveals its contents. Each time you highlight an entry in a particular pane, a new pane appears to its right. You can resize a column pane by dragging the handle at the bottom of the pane. To resize all the columns simultaneously, press the Option key while dragging. You can expand the entire window by dragging its handle at the bottom right. 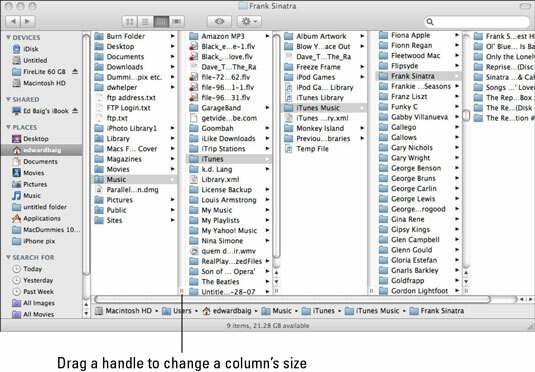 Cover Flow, the three-dimensional album art feature that Apple introduced awhile back in iTunes, helps you organize your files on your Mac. To access Cover Flow, click the Cover Flow icon in the Finder toolbar or choose View→As Cover Flow. By dragging the slider, you can flip through high-resolution previews of documents, images, Adobe PDF files, and more, just as you can flip through those album covers in iTunes. Watching a movie inside the Cover Flow view. Thanks to Cover Flow, you can skip past the first page in multipage PDF documents or slides in a presentation created with Apple’s own Keynote program. To do so, move the mouse over the Cover Flow image and click the arrows that appear.